Associated Press Desiree Linden of Washington, Mich., celebrates as she approaches the finish line, becoming the first American woman to win the Boston Marathon since 1985. 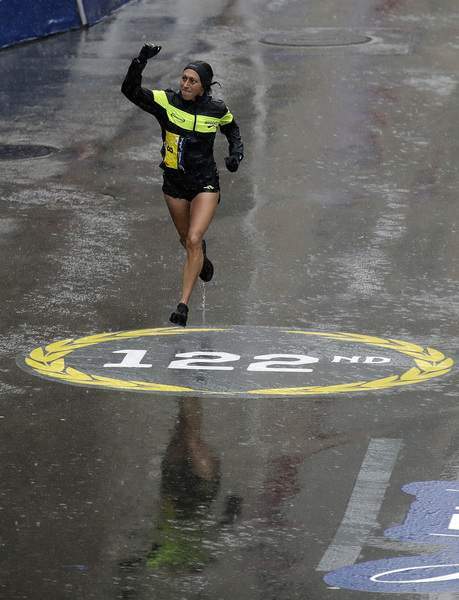 BOSTON – After slogging through just a few miles of icy rain and a near-gale headwind that made her feel like she was running in place, Desiree Linden decided she'd seen enough of the Boston Marathon for another year. A two-time Olympian and the 2011 Boston Marathon runner-up, Linden decided to stick around, outlasting the weather and the rest of the field to win the race's 122nd edition Monday in 2 hours, 39 minutes, 54 seconds. That was more than four minutes better than second-place finisher Sarah Sellers, but the slowest time for a women's winner since 1978. Linden was in Fort Wayne in January as the featured speaker at the Fort Wayne Running Club Banquet. Yuki Kawauchi splashed through the pelting rain, temperatures in the mid-30s and wind that gusted as high as 32 mph to win the men's race, passing defending champion Geoffrey Kirui in Kenmore Square to earn Japan's first Boston title since 1987 and the $150,000 first prize. Wearing a white windbreaker that was drenched and billowing in the wind, Kirui slowed and stumbled across the Copley Square finish line in second, 2:25 back, followed by Shadrack Biwott and three other U.S. men. The winning time of 2:15:58 was the slowest since Jack Fultz overcame temperatures in the high 90s to win the “Run for the Hoses” in 1976. “And it turned out I was in third, and I thought, 'Well, I probably shouldn't drop out,'” said Linden, who also earned $150,000. Sellers, who finished 4:10 behind, is a full-time nurse who had to train before or after work – at 4 a.m. or 7 p.m. She said didn't believe it when she was told she had finished second, or that she earned $75,000. “Yeah, I'm in shock about that,” she said. It was the second competitive marathon for Sellers, who was a distance runner at Weber State. Canada's Krista Duchene was third, with a total of seven Americans in the women's top 10 and – for the second straight year – six in the men's. The East Africans who have dominated the professional era of the race had their worst performance in decades: Kirui was the only Kenyan in the top 10 for the men's race; defending champion Edna Kiplagat, who was ninth, helped prevent a shutout in the distaff division.